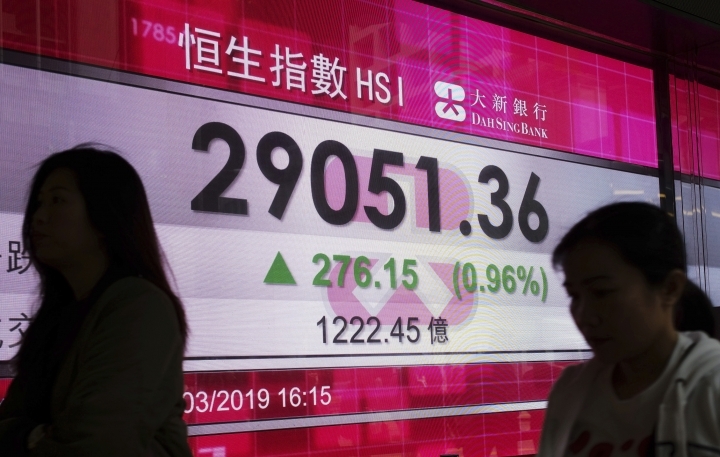 BANGKOK — Shares surged Monday in Asia after the release over the weekend of encouraging manufacturing data in China that suggest government stimulus efforts may be yielding results. Japan's Nikkei 225 index added 1.6 percent to 21,539.75, easing off earlier highs after newly released economic data showed conditions deteriorating. 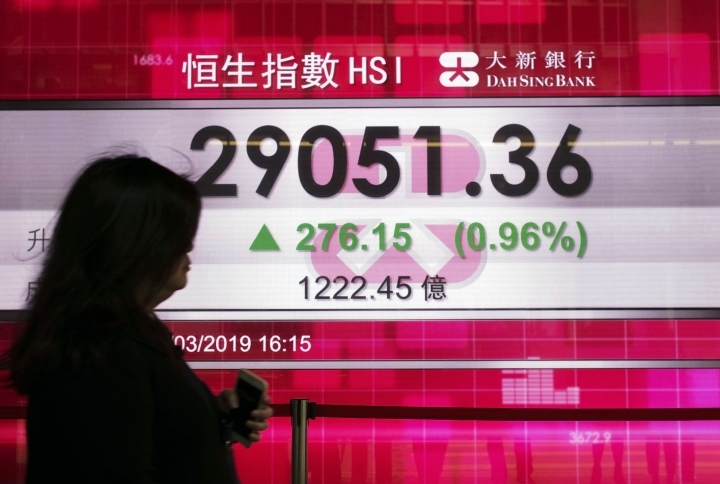 The Shanghai Composite index jumped 2.3 percent to 3,161.49 and Hong Kong's Hang Seng added 1.7 percent to 29,530.19. China's statistics bureau and an industry group said Sunday their monthly purchasing managers' index rose to 50.5 on a 100-point scale on which numbers above 50 show activity increasing. That was up 1.3 points from February. Sub-indexes for exports, employment and new orders all improved, and an index showing companies' expectations for future new business rose 0.6 points to 56.8. However, in Japan, the central bank reported Monday that a survey of major Japanese manufacturers showed business sentiment worsening in March compared with three months earlier. The central bank's "tankan" showed confidence of major companies such as automakers sank to 12 from 19 in December's survey. It was an inauspicious start for the day when the name of the era of the soon-to-be-emperor Naruhito, "Reiwa," was announced. Naruhito, the crown prince, will ascend the Chrysanthemum Throne after his father, Emperor Akihito, abdicates as of April 30. The name, whose poetic meaning is not entirely clear from the characters used, was drawn from the 7th century poetry collection Manyoshu. Elsewhere in Asia, South Korea's Kospi climbed 1.2 percent to 2,166.86 and the S&P ASX 200 rose 0.6 percent in Australia to 6,217.40. India's Sensex gained 0.8 percent to 38,970.73 and shares also rose in Taiwan, Singapore and Thailand. Indonesia's benchmark fell. Adding to economic gloom in Japan, the Nikkei Japan purchasing manager's index showed output in manufacturing falling at its fastest rate in nearly three years in March due to weak demand both at home and abroard. "The economic backdrop for the manufacturing sector in Japan remains fiercely challenging," Joe Hayes, an economist at HIS Markit, which compiles the survey, said in a commentary. "Asian goods producers face headwinds from slowing growth in Europe and China, while global trade risks are yet to be mitigated by a breakthrough in US-Sino relations." Stocks finished broadly higher Friday on Wall Street, with the S&P 500 index up 0.7 percent, to 2,834.40, a gain of 13.1 percent so far this year, a drastic turnaround for stocks after a jarring 14 percent sell-off in the last three months of 2018. The Dow Jones Industrial Average rose 0.8 percent to 25,928.68. The Nasdaq composite surged 0.8 percent to 7,729.32 and the Russell 2000 index of smaller company stocks picked up 0.3 percent, to 1,539.74. The rebound has been helped by the Federal Reserve's adoption of a more patient approach to further interest rate hikes. That has reassured investors, who'd worried that the Fed would continue to raise rates amid signs of a slowing global economy. In the coming week, investors are hoping for progress in U.S.-Chinese trade talks that are due to resume in Washington after a round in Beijing last week that U.S. Treasury Secretary Steven Mnuchin described as "constructive." Investors will be focusing more on corporate earnings in coming weeks, as the next big wave of company results kicks into gear in mid-April. ENERGY: Benchmark U.S. crude picked up 35 cents to $60.49 per barrel in electronic trading on the New York Mercantile Exchange. It rose 1.4 percent to settle at $60.14 a barrel on Friday. Brent crude, used to price international oils, advanced 53 cents to $68.11 per barrel after closing 0.8 percent higher Friday at $68.39 a barrel. CURRENCIES: The dollar rose to 111.05 Japanese yen from 110.85 yen on Friday. The euro strengthened to $1.1234 from $1.1219. The British pound slipped to $1.3034 from $1.3039 after lawmakers on Friday rejected for the third time Prime Minister Theresa May's plan to leave the European Union. Britain now has until April 12 to tell the EU what it plans to do next. It must cancel Brexit, seek a longer delay or crash out of the bloc.